Fancy Panz are stackable and easy to use. 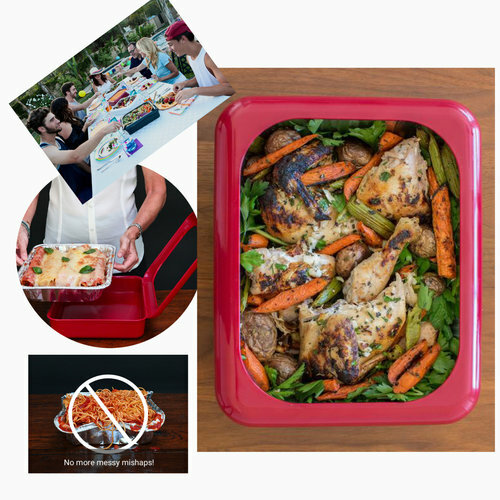 Place your foil pan containing hot or cold food into your Fanzy Panz, close the frame, snap on the clear top and you are ready to go! When serving, remove the clear top and place under the Fancy Panz where it nests perfectly. When leaving the event, simply remove the foil. pan. Best of all, no more dirty dishes to bring home and NO MORE LOST SERVE WARE! Dress up and Protect your Foil Pan! Forget showing up to events with those flimsy, embarrassing foil pans! Dress up and protect them with a Fancy Panz. 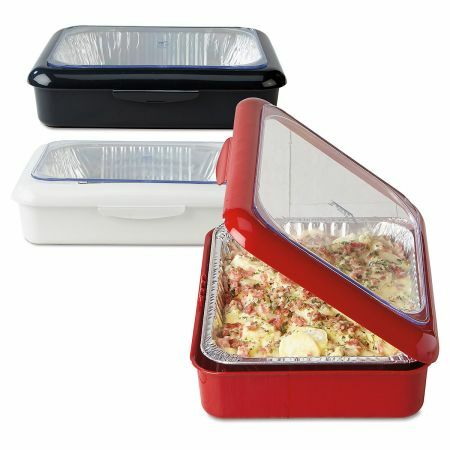 Fancy Panz is perfect for home use and especially convenient when traveling to potlucks, tailgates, picnics, and BBQ’s!